Bathrooms can have a reputation of being cold and sterile, covered head to toe in ceramic tile. It's hard enough to get out of bed in the morning, why should we have to force ourselves out of the coziest spot in our home into the least inviting space of all? We won't stand for it! There's been a serious trend lately of room-like bathrooms which we can't get enough of. Cold, hard bathrooms have died and gone to hell in a hand basket and warm, cozy bathrooms are here to stay! One of the best ways to achieve that is by adding wood finishes wherever you can- as shown here in some of the most beautiful bathrooms of Pinterest. Are you planning a remodel? Consider a wood vanity, wood or wood-like tile on the floors or paneling on the walls, or floating wood shelves. (Wow the word wood is starting to look really funky.) What about a quick upgrade? Swap your mirror for one with a wood frame, add a small wooden stool or chair to hold your towels, or top your commode with a wooden tray to corral your accessories. Or pull in that gorgeous antique hutch from your grandmother that's been collecting dust in the basement all these years (if only, amirite). The options are endless! And if you really want to take your bathroom to new heights, try adding a plant, a painting, and/or an antique rug. You'll never go back. PS: Follow us on Pinterest and Instagram for more inspiration! Happy summer! Considering it's inappropriately hot outside everywhere in the US, we thought it a good time to discuss the cool tone that is light blue. We've been noticing it quite a bit in our pins lately and its comeback is in full swing. Blue has always been a lovely color but light blue can be especially intimidating considering its associations. How do you keep it from looking like a little boys room? Well, see below. We thought these were perfect examples of light blues used in ways that make us rethink all the things we ever thought about it. Sorry we labeled you, light blue! Turns out you're a striking shade when used unexpectedly. 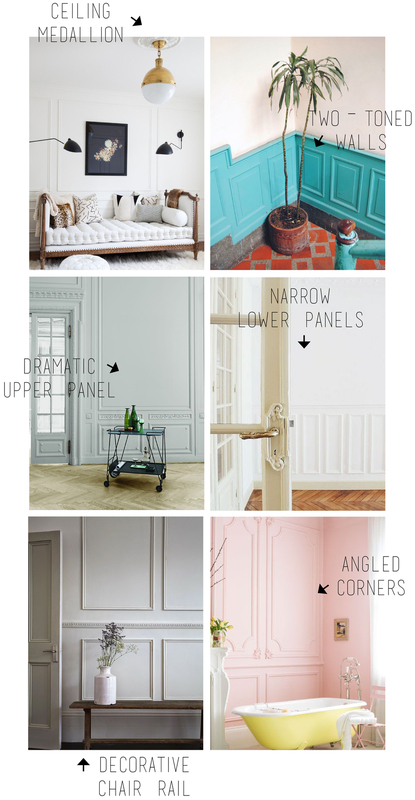 Follow us on pinterest here for more daily inspiration and subscribe to our blog posts below! Happy Thanksgiving, friends! But on to our favorite holiday...Christmas! It's the best time of the year. We cozy up, drink warm things, sit in candle and twinkle light and watch White Christmas on repeat while making/wrapping gifts. So in extreme anticipation of decorating and setting the mood, I've been pinning inspiration out the wazoo. Last year, Kyle and I just had a tree and that was it! Not this year, my friends. No, this year there will be wreaths, garland and lots o' candles. And since we don't have a fireplace mantle situation in this city apartment of ours, I'll have to get creative. So, for your viewing pleasure: a taste of our favorite ideas-inducing Christmas decorations below and our Christmas Pinterest board for even more. Enjoy! It may be because I've watched Marie Antoinette too many times (the Sofia Coppola one- is there another?) that now I truly believe moulding is the solution to a soulless room. There isn't a scene in that movie that doesn't feature some seriously dramatic and stunning French wall paneling. IT'S SO GOOD. Now you have a movie to watch this weekend that will provide you with an eye feast of awe-inducing wall decoration. Happy Friday! Oh and follow us on Pinterest for more inspiration! 'Tis the gift wrapping season! I quite enjoy wrapping presents. I can sit on the floor, dim the lights, light a candle and sing along to White Christmas while judging how high waisted mens pants were back then. So, see above. OBVIOUSLY we like craft paper and are really hopping on this fresh pine train. Check out our pinterest board for even more inspiration and hopefully you're one step ahead and have wrapped all your gifts already! Thank you for subscribing to the Rehabitat blog. You will now receive an email alerting you of our latest post. If you're like one of us (me), you haven't thought too much about what kind of pie you should make (it's between this or this), or if anyone will eat that recipe of creamed kale that looks pretty because you're too busy thinking about which placemats will set the right mood or if gold leafing votives will be a good activity for your 3 and 5 year old nephews. Also, if you're like one of us (me), you're last minute and not willing to set a Thanksgiving table 2 weeks prior just to share on the blog. Readers will have to wait until Thanksgiving at 8pm or worse, the day after, to see what the Rehabitat ladies' "tablescape" (I'M SORRY) looks like. And that, in the blogging/styling/design/party planning world, is a DISGRACE. At least we can laugh about how we will not be eating at a 30 person long, outdoor farm table effortlessly wrapped in burberry blankets and sitting on haystacks. But hopefully, it will still be worth the wait. Follow us here to see more of our inspiration!